Organizing is seldom a quick or easy task which is why many people put it off as long as possible…or don't do it at all! We go into the project with high hopes and expectations that we will rarely be able to meet because it is a process. Sure, I can organize the hall closet in an hour or so, but actually locating homes for all of the items that no longer belong in the closet is where the trouble starts. You see, if I take the gift wrap out of the hall closet with the intention of putting it in the guest room closet (so I can wrap gifts on the bed when needed), I now have to create space in the guest room closet for the gift wrap…you get the idea. What about embarking on the annual garage spring cleaning and just can't find a place to start? Well help has arrived! First, break down a really big job (like the garage) into smaller, more manageable pieces. For example, instead of tackling the entire garage, focus on one shelf or even start by removing all of the lawn supplies you can see. By taking out categories of items one at a time, you are taking one giant step toward completion of the project as you are sorting while removing. Just make sure you don't throw it into the driveway in a big heap or you will have to re-sort and waste time. When you have a job like the closet that will create a domino effect for organizing other spaces to make room for stuff being shifted around you can use the same principle on different scale. Organize the hall closet and the gift wrap that was removed is bound for the guest room closet, we know that. Now odds are that the guest room closet is in need some organizing TLC and we know that already (because you live there). 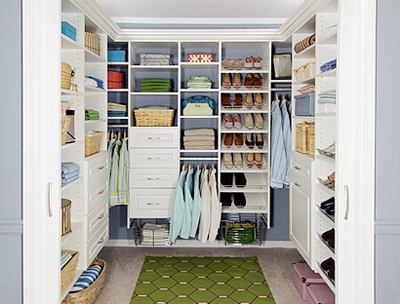 Who says that both closets have to be organized at the same time? The second closet could easily be completed the following weekend or later in the day. Only proceed to the second closet if you are energized and motivated. Even so, know your limits and have a wind down plan in place should you lose interest. Also consider the true nature of your stuck-ness. Are you physically tired, have you tried to do too much in one session, or are you struggling to make decisions? Before you say another word, I know what you are saying. No…no…no… I just feel so overwhelmed! If this is truly how you feel, try to compare this project to a detailed, multi-faceted task you have completed in the past or (yikes!) even enjoyed. It seems everyone in the world scrapbooks except me so let's use that as an example. If I wanted to create a scrapbook for each of my children, I would first need the children (read: photos and memorabilia), I would need the book, I would need some way to put the photos in the book, and finally, I would need to create the time to make it all happen. Fancy paper and embellishments would be nice but they aren't vital to the completion of my scrapbook, right? Now, let's compare the scrapbook to the garage. Getting it done takes some planning just as I need children to make scrapbooks for my children. I sort pictures by child, you sort garage stuff by category (sporting equipment, home improvement, tools, lawn tools, etc). I use an Elmer's glue stick to adhere my photos to the paper, you use cardboard boxes to sort and store items. Not, ideal but certainly convenient. Next consider the fancy Craftsman rolling tool armoire and matching plastic totes as the paper and embellishment of my scrapbook. Not required but certainly makes it look better! This is truly a silly analogy but hey, I'm pretty silly. The idea is to use what you know (well) then create a mental template based on that process for more difficult tasks. Use this for all your tasks…even long division…and you are sure to succeed!